It’s hardly news to anyone currently playing the game that Wizards revisited an old world for the first time with last year’s Scars of Mirrodin. What may perhaps be a little more surprising to those who weren’t playing back in 2003 is just how well Wizards preserved some of the look and feel from the old set without making the new one feel ‘recycled.’ In looking at our first Mirrodin theme deck, Sacrifical Bam, you might almost be forgiven for mistaking it for a more contemporary model. Spellbombs, mana Myr, and Replicas adorn this heavily synergistic creation, but look a little closer and you’ll see significant differences, too. In truth, Mirrodin was the beginning of one of the game’s darker periods. For those looking for a breakdown of the worst offenders, you might take a look at Wizards developer Tom LaPille’s recent column on the matter. The good news is that Sacrificial Bam only contains two of R&D’s “skeletons in the closet,” and the deck doesn’t touch affinity. Rather, like Coldsnap’s recently-reviewed Beyond the Grave, the deck looks to deploy creatures and take advantage of sacrifice effects. Like many such decks, the 26 creatures of Sacrificial Bam fall somewhat-neatly into a small number of categories, in this case six. We’ll start with the accelerators, who help you ramp into your curve. Unsurprisingly, these are mana Myr, and there are four of them (two each of Leaden and Iron). A familiar enough sight to the contemporary player, as they have been reprinted in Scars of Mirrodin, although their flavour text has been changed. The flavour texts for Mirrodin cards often reflected the fact that many of these cards were part of cycles. 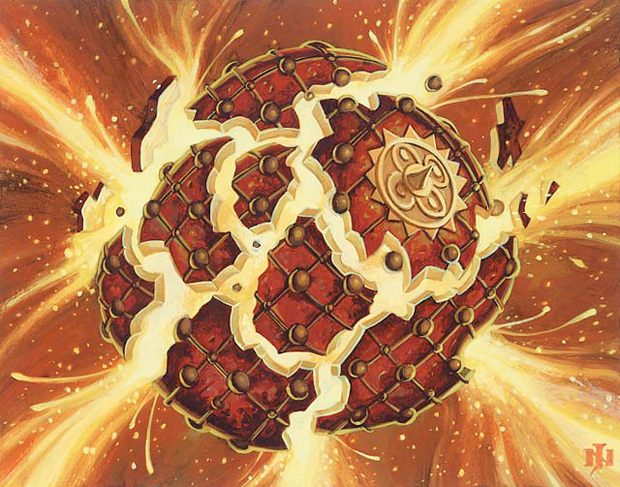 The Myr then as now all had similarly-structured flavour text, and you’ll see it reflected in other cycles such as the Spellbombs and Replicas. Next we have the Disciple of the Vault– the only card of his particular category in this deck so we’ll leave the category named after him. This ranked as the number 3 R&D mistake referenced in the article above by Tom LaPille, though you’ll find the power level isn’t quite as high when he’s not slotted into a constructed deck. In a deck that still bases so much of its action based around sacrificing artifacts, though, he’s a natural fit. Even if your opponent doesn’t play a single artifact, this card will usually more than pay for himself. It’s also uncommon to have a one-drop that’s still relevant and useful when drawn at nearly any part of the game. Next up we have the replicas, artifact creatures who have the ability to sacrifice themselves for a small effect. The Nim Replica can pick off small or wounded prey, while the Goblin variant smashes artifacts. The deck issues you two of each. Then there’s what we’ll call the fodder, artifact creatures that can’t sacrifice themselves for an effect, but still grant one when they die. The Myr Retriever is another weenie 1/1 creature that’s useful even when drawn late, because it can be used th chump an attacker and then trigger his graveyard ability, returning another artifact from the graveyard to your hand. The Cathodion is an interesting case. Unusually efficient for an artifact creature (3/3 for 3), the balancing feature there was the fact that it returns the three mana you paid for it back to you upon dying. When the game had mana burn, this was a gamble- sometimes you had a use for the mana, other times you lost three life because you couldn’t find a way to get rid of it. With the rules chance eliminating mana burn from the game, this fellow’s all upside! Like the Retriever, you get two of these in the deck as well. Finally there’s the Dross Scorpion, which is unique because its graveyard trigger is extended to all artifact creatures, regardless of who owns them. Every time an artifact creature heads for the scrapheap, you get to untap an artifact (we’ll find a few of the non-creature variety in the next section). The problem with graveyard triggers is that they can be a little hard to induce at-will, as oftentimes your enemoy won’t always cooperate and kill it for you. That’s why the deck’s next class of critters are the artifact eaters, cards which gain a bonus whenever you sacrifice an artifact to them. First up is the classic Atog, a 1/2 body which becomes a 3/4 until end of turn when he eats an artifact (and bigger if you eat more than one). The Krark-Clan Grunt’s power bonus is smaller, +1/+0, but he also gains first strike until end of turn. Not big enough for you? There’s always the Megatog, one of the deck’s two rares. A 3/4 who gets +3/+3 every time he munches on an artifact. These cards make very solid closers, because if your opponent lets one through you’ll often be able to sac your board for the win (just pray they don’t have instant-speed removal). Finally, we get to the bruisers, big bodies who don’t directly interact with your other artifacts in a positive way but are there to apply some beatdown to your opponent. A 4/4 flyer for four mana is a very good deal. Too good, in fact- to keep your Rust Elemental happy (and believe us, you want him happy), you’ll have to sacrifice an artifact to him every turn. The good news is, a 4/4 flyer is a deal-with-or-die card, so you likely won’t be losing too many to it. Lastly, there’s the deck’s other rare in the magnificent Pentavus. The Pentavus is expensive and a touch gimmicky, sure, but in every preconstructed deck he’s found a home in, he’s been an all-star. Here, in combination with the Disciple of the Vault you’re able to pay two mana to ping your opponent for 1, at instant speed, over and over. Just make a Pentavite, then dock it again, repeat repeat repeat. With the Dross Scorpion out, you’re paying two mana to untap an artifact. Even on its own, the Pentavus is a defensive powerhouse- two mana will let you blank any attacking creature without trample, at no loss to the Pentavus (even if the Pentavus itself is tapped from attacking). Just a very versatile card that’s found a welcome home in Sacrificial Bam. As you can see, you’ll have a solid growth path in the early game, and should have little trouble getting a good number of quality starts here. Things do thicken up a bit in the middle, but a concentration of 2- and 3-drop cards gives you plenty to do in the mid-game. Add in the fact that you have access to four mana Myr, and you’ll seldom be floundering for a play. The non-creature support for the deck is a touch more limited, but still very useful. You have a little extra mana ramping/fixing in a pair of Talismans of Indulgence. 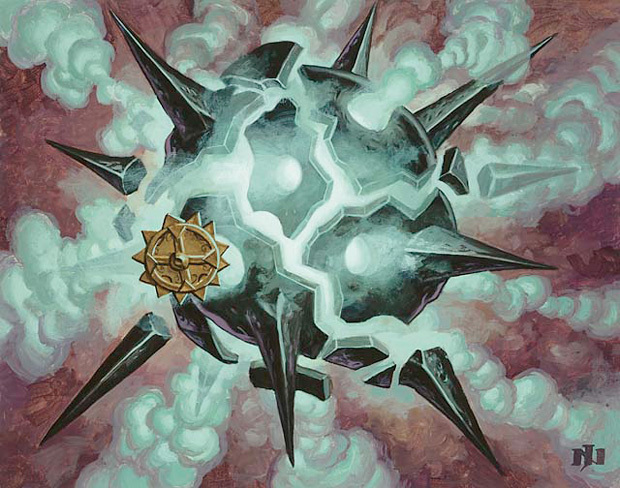 Twin Necrogen Spellbombs offer either discard for your opponent or draw for you, depending on what’s best in the moment, while a pair of Pyrite Spellbombs kick off your removal suite with a Shock-like effect. Sacrificial Bam may focus on killing of its own creatures for benefit, but it’s certainly not above killing its opponent’s in the process: a Shrapnel Blast offers massive killpower at a bargain price, while two Irradiates should manage to be a solid kill against just about anything by the mid-game. Finally, you have two supplemental cards in the form of a Nuisance Engine and a Skeleton Shard. The Engine is a card that’s found itself out-of-place in the past (see: Planechase’s Metallic Dreams) as it’s just a little too slow to be useful (spending five mana for your first 0/1 ‘Pest’ is painful). In Sacrifical Bam, it’s a top performer. Although it’s still painful to pay so highly for a Pest, there are so many more uses for them here. As for the Skeleton Shard, it’s a natural fit as well, giving your poor sacrificed creatures a second lease on life. If the Disciple of the Vault was one of Wizards’ R&D’s “skeletons,” the other is the Artifact Land. Often regarded as one of the game’s greater mistakes, these are land that enter the battlefield with no drawback, yet count as both a land and an artifact. Unsurprisingly, the deck contains eight of them: four each of Vault of Whispers and Great Furnace. Had they come into play tapped we might well have seen a diminishment in their power, but here they are in their full, splendourous glory. May your Atogs munch on Swamp and Mountains for dinner! We’ll be back in two days with the second half of the review, showing the deck in action. Hey, look! It’s the Sacrifical Bam I bought a few weeks ago! I personally found the deck similar to aggro-combo but it’s a little inconsistent – you either have all your artifacts out with nothing to sacrifice them with, or you have all your sacrifice-outlets with no artifacts for you to sacrifice. It might be a little consistent, but I think all the precons are that way overall. They all require some fine-tuning. I also think that against the other precons from this block, Sacrifical Bam has the potential to annihilate the competition. Affinity is a witch. I feel sort of naughty playing Thoughtcast with the Seat of Synods I use in my tezzy deck. Though it’s the only card in it with affinity. So glad they didn’t bring affinity back despite me not playing competitive and all. Makes me wonder if a “Mirrodin redo” was part of the reason to revisit the plane. Anyway, looking forward to see how this deck shapes up with the others. Unfortunately I’ve yet to get my hands on that deck, but it pretty much sounds like a pre-Alara Jund beatdown … hey, the name says it all. Plus some old-fashioned Spellbombs which are among the coolest and most flavorful artifacts ever printed. I wonder what this deck would look like if beefed up with some Scars goodies … wouldn’t that be an idea for an Ertai’s Trickery, combining both Mirrodin-Blocks theme-wise? Also putting the best of both blocks against one another would be cool. Hey, everyone. If you didn’t know, Ertai has been sick with something nasty recently. I hope you start feeling better, friend. Cheers for that, mate- that makes two of us!